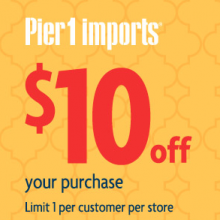 *HOT* Pier 1 Imports $10 Off $10 Coupon! Head over to Facebook and “Like” Pier 1 Imports. They have a new “Daily Dealy” offer. Today, they are offering a $10 off $10 printable coupon! This coupon is good in-stores July 25th through July 27th! This offer is one per customer per store! I’ll be going there today, I’ll let you know what I find for $10 or less! Coupons Jul 25, 2011 in free, household, Pier1 · Expired!